October 14, 2011 - Boeing and Cargolux Airlines shared another milestone in the history of the iconic 747, as the airline took delivery of the first Boeing 747-8 Freighter on Thursday. Following delivery at the Boeing Delivery Center at the company's Everett site, the airplane departed for Seattle-Tacoma International Airport, where the new freighter will receive its first cargo load, destined for Cargolux headquarters in Luxembourg. Boeing, Cargolux and Nippon Cargo Airlines announced the initial orders for the 747-8 Freighter in November 2005. This delivery comes nearly 18 years after Cargolux was the recipient of the first Boeing 747-400 Freighter, which went on to become the workhorse and standard of the air cargo industry. "This is a great day for The Boeing Company and for Cargolux," said Jim Albaugh, president and CEO, Boeing Commercial Airplanes. "The 747-8 Freighter is truly the Queen of the Skies for the 21st Century, and will continue the promise of the 747 for decades to come." 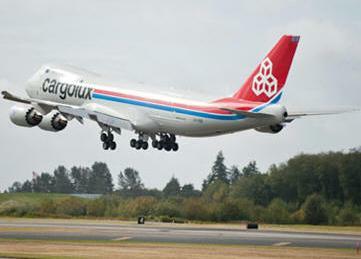 Cargolux has ordered a total of 13 747-8 Freighters ? its 10-airplane launch order in 2005 and a follow-on order for three additional airplanes placed in 2007. The airplane will be a perfect addition to the Cargolux fleet, said Frank Reimen, Cargolux president and CEO. "The new Boeing 747-8 Freighter will help Cargolux maintain its position as an industry leader that we built upon our 747-400 Freighter operation. We look forward to the efficiency and environmental benefits that come with this great airplane," he added. "The new 747-8 Freighter stands as a monument to the incredible team that designed and built this airplane," said Elizabeth Lund, vice president and general manager of the 747 program. "And it's a pleasure to deliver this airplane to Cargolux, an airline that has long been dedicated to Boeing and the 747 program." The 747-8 Freighter offers double-digit improvements in fuel burn, operating cost and lower emissions over the airplane it replaces. It also provides 16 percent more revenue-generating cargo volume, which allows it to hold seven additional pallets. The new model carries a maximum structural payload capacity of 147.6 tons (133.9 metric tonnes) while providing the same nose-door loading capability, industry-standard 10-foot (3-m) -high pallets and real-world cargo density capability at 9.9 pounds per cubic foot (159 kg/m3) as the industry standard 747-400 Freighter and maintaining interlining capability with the Boeing 777 Freighter. The new GEnx-2B67 engines incorporate the latest technologies ? such as a composite fan case and blades and a revolutionary turbine ? to create double-digit efficiency gains over the engines it replaces. Eight customers have ordered a total of 75 747-8 Freighters. The 747-8 is offered in two main variants: the 747-8 Intercontinental (747-8I) for passengers and the 747-8 Freighter (747-8F) for cargo. The first 747-8F performed the model's maiden flight on February 8, 2010 with the 747-8 Intercontinental following on March 20, 2011. Delivery of the first freighter aircraft was delayed before occurring in October 2011; passenger model deliveries are to begin in 2012. In July 2011, confirmed orders for the 747-8 totaled 114, including 78 of the freighter version, and 36 of the passenger version.